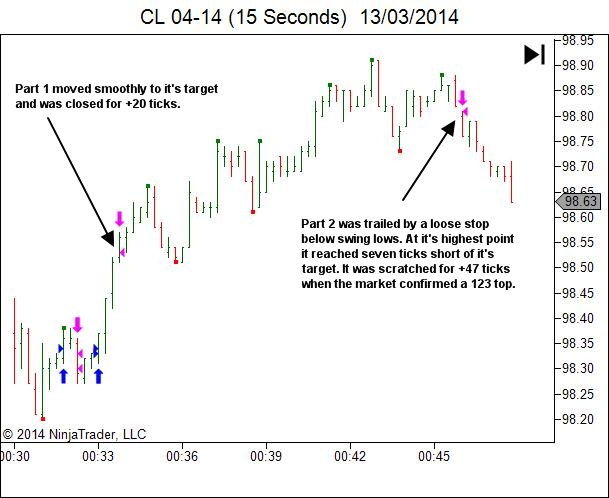 If a trade is scratched or stopped out and the premise remains valid, you should consider re-entry. You’ve just taken a loss. It’s hard to get back in and risk further funds. Given the uncertainty of price movement, it’s unreasonable to expect that you’ll get a perfect entry every time. Often you’ve got to work that entry. Scale out! Scale back in! We’ve talked about re-entry a few times in the past. you have truly understood and accepted the longer-term nature of this game (profiting over a series of trades rather than each individual trade). I’d like to suggest one additional factor that can significantly add to your confidence in re-entering a trade. And that is having an awareness of the bigger picture STRUCTURE of the market, such that you are able to identify the places on the chart which offer multiple-R trade opportunities. 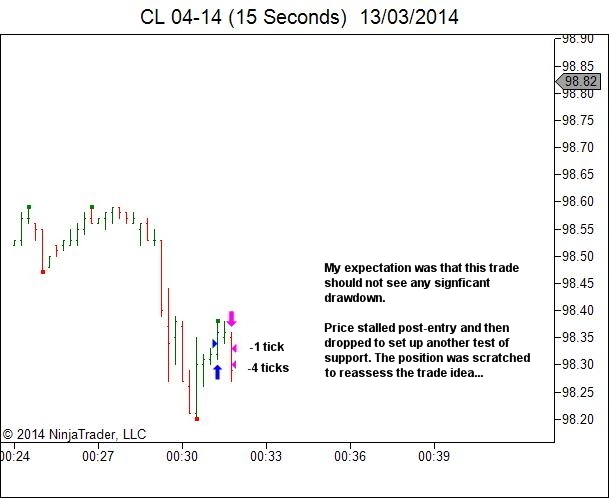 Where you trade on the chart is much more important than how you get in to the trade. If you’re trading at a good structural location, the multiple-R potential will allow some imperfection with your entries. 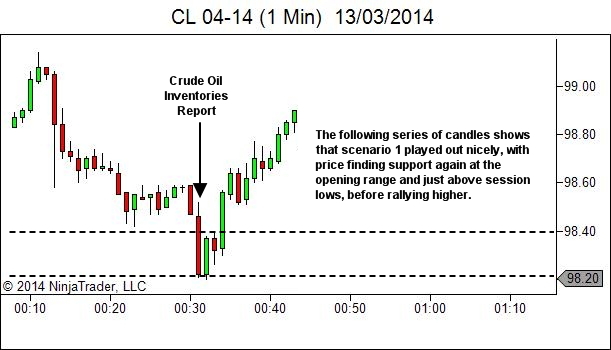 In the chart below we see Crude Oil (CL) in the seconds before release of the Crude Oil Inventories Report (often a big market mover). 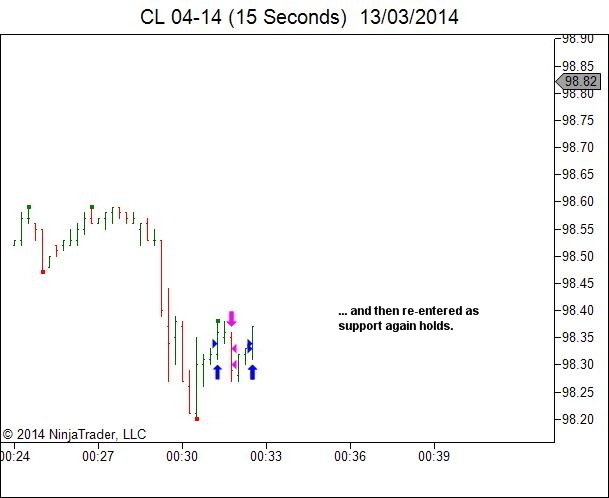 Price opened the pit session by gapping down at A, before finding support for the first half hour within the opening range. A break higher at B led to a test of higher resistance at C.
Prior to the news release, price is holding just above prior opening range support at D.
My plan for the news release involves several possible scenarios. 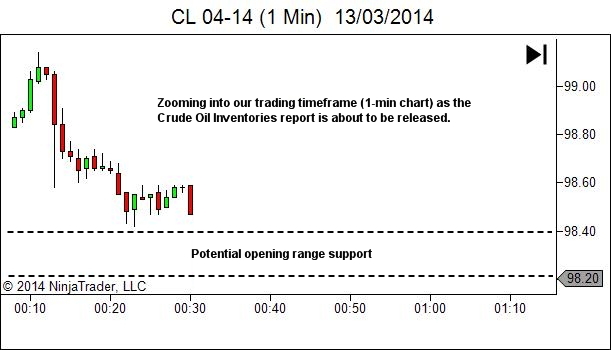 In scenario 1, the opening range will provide further support and I’ll be seeking entry long. In scenario 2, price will push easily through the area of support and I’ll seek entry short on the first pullback following the break to new lows. 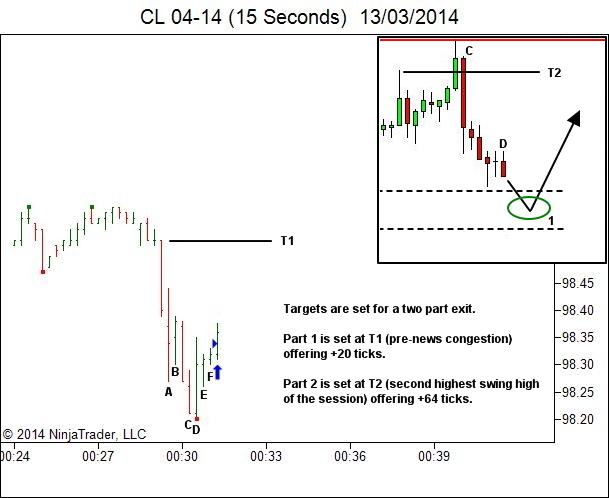 And in scenario 3, price will rally from the news release. 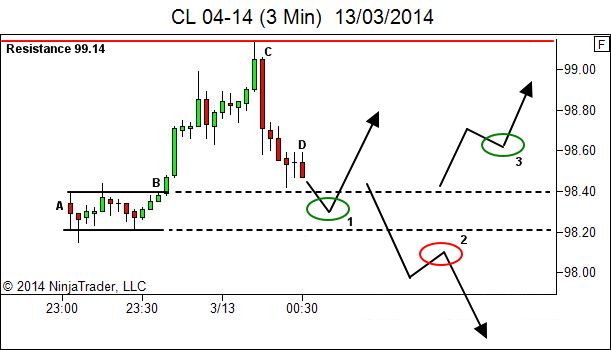 If this occurs I’ll look for entry long on the first pullback. If something else happens… the plan will simply be adjusted to accommodate whatever price offers us. 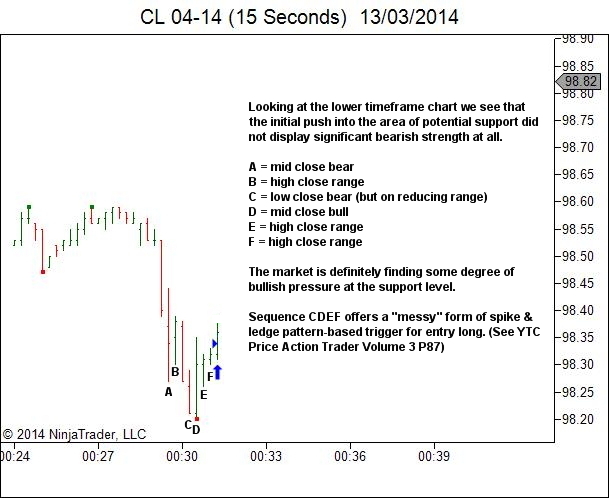 We’ll now look to the lower timeframe chart to examine the trade entry. The initial entry was scratched. A small loss was taken. But it was also possible because of an awareness of the structure of the market. 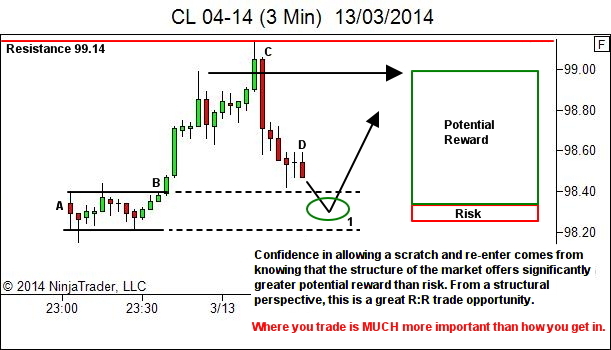 In the place I was trading, market structure offered significant R:R potential. When the trade didn’t immediately move in my favour I was able to scratch, reassess with an objective mind, and re-enter, confident in the fact that the structure of the market afforded me this imperfection with my entry.